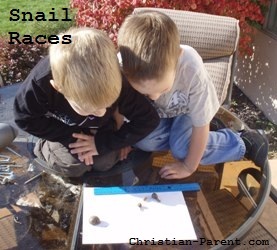 April 18, 2012 1 comment on "Snail Races"
Although a menace in your garden, snails are fun little creatures for preschool-aged children to play with and observe. My boys never fail to find two or three snails of various shapes and sizes congregating at our backyard water fountain. Snails are fun to watch. You would think they are slow creatures, but they can actually move quite fast. My boys brought several in the house in a plastic storage container, and after an hour or so I had to remind them to check on their snails because they were trying to escape! Today we decided to hold a snail race. If you place the snails on a white piece of paper, you can see the trail of slime they leave behind them, which is sure to be of great curiousity to your preschooler. We lined up the snails in a row on the piece of paper and watched them take off. One headed straight for the finish line…it wasn’t even a close call! This is a fun activity to do when learning about snails. Read a book about snails with your preschooler and then hold a snail race. 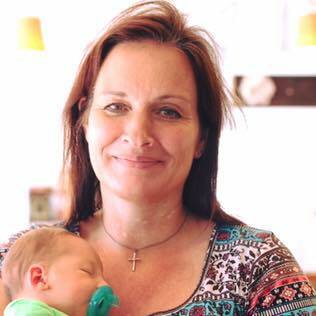 Your preschooler will love it. You can also use this opportunity to teach them about numbers and measuring. You can lay a ruler next to the paper and measure how far the snails have travelled. Your preschooler should be able to help read the numbers on the ruler, and you can explain the concept of inches and centimeters. Activities like this really help reinforce these mathematical concepts in young children. Have fun, and enjoy this beautiful fall weather! 1 Comment on "Snail Races"